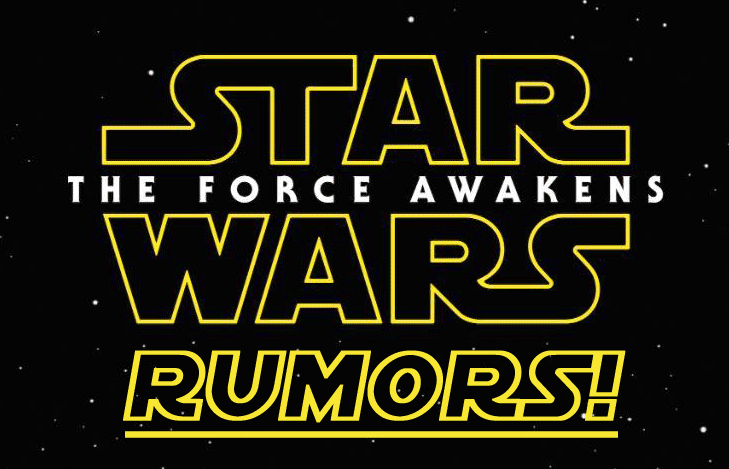 It's time for another round of Star Wars Episode VII: The Force Awakens rumors. Our friend Jason Ward over at MakingStarWars.net has posted another round of rumors. Some of these deal with a major twist in the film, so even if you are following the spoilers, you may want to think twice about this one. That being said, Jason also states that he thinks some of the elements of these rumors are dubious at best. Keep both of those facts in mind if you choose to keep reading. So, if you are avoiding The Force Awakens rumors then stop reading now. This is you official SPOILER ALERT! "Luke is huddled against a wall, he is looking at an approaching figure. We don’t see his face at all and his body is hidden by the dark, we see various flashes of his hood is over his head and the light only shows his grey beard. Someone says “Luke?”. He is startled and cowers to his knees. we are shown his robotic hand, sans glove, with a burn mark exposing the robotic components. An arm reaches out to try and grasp his light sabre which is a few inches away on the floor. The light sabre is smoking. Luke struggles for it and we hear a disembodied voice say “You’ve failed, Skywalker. Have you felt it? Your struggle with the darkside and the light “. We hear the first vocals from Luke and his words staggered and stuttered. He tries to stand but a cackle makes him cower again. He is further goaded by this voice before he hears a familiar voice and stands up and pushes his hood back much like obi wan kenobi did when he first saw Luke in ANH. This is our first proper look at Luke. This Luke is wizened but crazed, his eyes twitch and are bloodshot, his robe is tattered, ripped and his beard is scraggy and his hair grey and long. Luke walks down a few steps and his looking at the tomb. The disembodied voice says ” You will fail, Skywalker”. Luke falls to his knees and screams out with arms outstretched. A tremor reduces a wall partition to rubble and the voice laughs louder. ” They will all die. I am your only choice”. Luke uses a statue to pull himself up and he begs the voice to stop. He has no fight left. Luke uses the force to grab his weapon and he ignites it this time the glow of his green sabre fully shows us a classic glimpse of an older Luke. We then hear footsteps and the ignition of a second light sabre, a red glow appearing in a pool of water near the tomb. (Gwendoline Christie): plays the lead Shock Trooper and she commands a huge ship called in the production notes ” Imperial Hand”. She wears a chrome armoured suit which can cloak itself for stealth missions – this ability is used twice in the move. Her character is said to be "demeaning to peers, arrogant, viscious and fearless. She uses a light saber also and is heavily skilled in hand-to-hand combat. She kills 2 Jedi Padawans in the movie whilst searching for both Finn and Rae. “Once beautiful now grotesque” heavily scarred face and military hair cut. “Battle hardened – an elite killer”. (Domhnall Gleeson) – This will shock people but this character is an Imperial Cadet and the son of the huge character. A deserter of the Alliance after finding out they are constructing a super weapon to irradicate the empire before they can use their own weapon. Effectively turning the rebel alliance into the empire by default. DG plans to inflitrate and destroy the weapon from within. The one that resonated most with me was Serkis' dialogue to Luke in the castle. I thought the teaser trailer dialogue seemed a bit disjointed, as if taken from a larger piece and picked apart. It makes sense that there's more to it and I like the idea of Luke hearing voices. That said, no pun intended, I put as much credence in these rumors as any other and can't wait to find out what's real and what's not! This is the movie is LOVE it to be! really hope this is true! I love the sounds of this for the most part. If I was a betting man I would say the "once beautiful" inquisitor is Luke's former wife who went evil when he left her to guard the tomb and now she uses the jedi skills he taught her to kill her ex-husbands jedi padawans. wow once i read the han section i realized i went beyond the point of no return. SPOILERS for real. "Lol- I see your point, but I kind of imagine this the way I imagine the way Disney does marvel. No one comic is followed but elements from greatest hit comics are mixed with origional story"
I don't believe most of this. It sounds like the same red herrings that were floating out there before Episode 1 came out. I hope they dont over do it, try too hard and make it overly complex. The plots of the original movies were short and sweet. The story line and the characters connected with the audience and were relatable. I think thats why the prequels didn't do what they could/should have. This is a carefully cooked up story to throw fans off. The real story is carefully being kept under wraps. I have read several stories out there that seem almost believable like this but are in fact not. Trust me this seems believable but is not. Wait and see and you will see that I was right.